How to Link Aadhaar to Mutual Fund Investments Online? The deadline to link Aadhaar to your Mutual Fund investments has been extended to March 31, 2018. This can be done both Offline and Online. 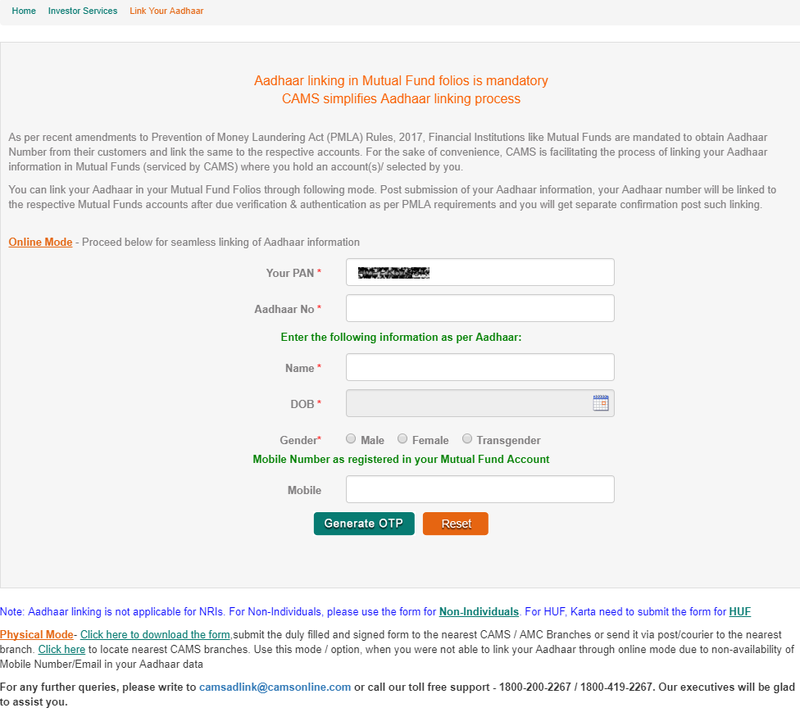 For offline you need to submit the physical form along with Aadhaar copy to the respective Mutual Fund AMC office or their respective registrars. The good news is you can link Aadhaar to your mutual fund investments online in just 5 minutes following some simple steps. Below are the links to all 4 registrars to link Aadhaar to respective mutual Funds they service. Also here is list of Mutual Funds serviced by CAMS & Karvy. Other than above two Franklin Templeton and Sundaram serves their respective mutual fund AMCs. 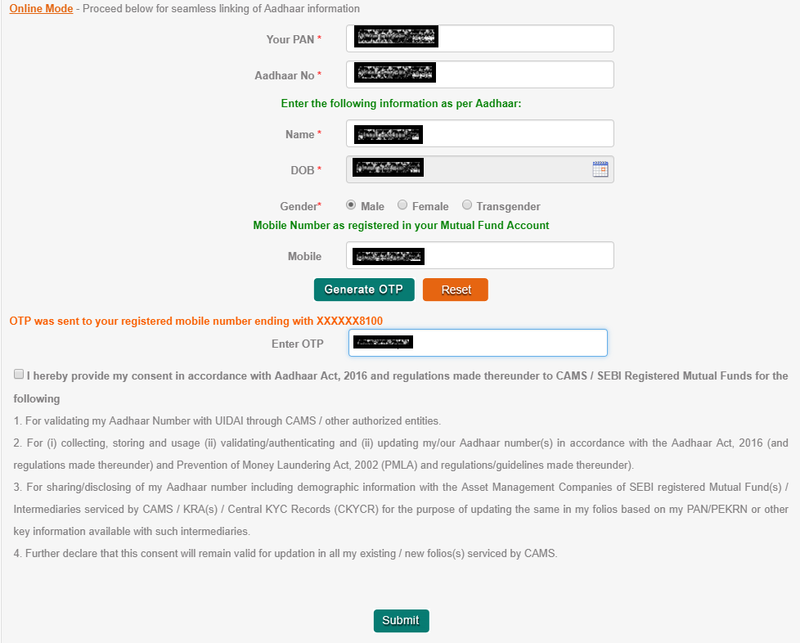 How to link Aadhaar to Mutual Fund investments on CAMS Online? Step 2: Once you submit the details, then you will receive the OTP (One Time Password) to your registered Mobile. You have to enter the same in below screen. This will link your Aadhaar to all the mutual funds serviced by CAMS where you are sole or joint holder or guardian. If everything has gone well, you will get below confirmation message from CAMS on the screen. Many users have faced issues while linking Aadhaar. Have patience, it may take 4-5 attempts. Also Read: How To Verify if Aadhaar Number Is still Active? How to link Aadhaar to Mutual Fund investments on KARVY Online? Step 4: Once you submit the Aadhaar, you will receive the OTP (One Time Password) to your registered Mobile. You have to enter the same in next screen. This will link your Aadhaar to all the mutual funds serviced by Karvy where you are sole or joint holder or guardian. If everything has gone well, you will get below confirmation message from KARVY on the screen. In case you face problem with the above method, you can try SMS. Also Read: How to invest in DIRECT Plan of Mutual Funds? Send (ADRLNK <space> <PAN> <space> <AADHAAR NUMBER> <space><Y>) to 9212993399 from your registered mobile number with Karvy. “Y” in the above message stands for your express consent (as given above and read by you) to authenticate and seed your Aadhaar across all Karvy serviced Mutual Funds / AIF as on date. How to link Aadhaar to Mutual Fund investments on Franklin Templeton? Franklin Templeton AMC has its own RTA. Click on the link to go to Link Aadhaar to Mutual Fund investments Page on Franklin Templeton. Also Read: SIP Vs. Lumpsum – Which is the Best way to Invest in Mutual Fund? How to link Aadhaar to Mutual Fund investments on Sundaram BNP Paribas? Sundaram BNP Paribas AMC has its own RTA. Click on the link to go to Link Aadhaar to Mutual Fund investments Page on Sundaram BNP Paribas. What if you DO not link Aadhaar to Mutual Funds? The mutual fund account would be frozen which means investors would not be able to initiate ant transaction like Purchase (New & additional purchase), Redemptions, Switches, New registration of SIPs, STP, SWP, etc. However automatic transactions like existing SIP, dividend pay-out, closed fund redemption and non-financial transaction would be allowed. As of today Government has mandated Aadhaar linkage to all financial investments, but this has been challenged in court. Supreme Court may give some ruling going forward which may/may not modify existing orders. The deadline has to link Aadhaar has been extended to March 31, 2018 from December 31, 2017. In case you have NO inhibitions or objections to link Aadhaar to your investments go ahead and DO it. If you want to wait for Supreme court verdict, expect something in March 2018. How to invest in DIRECT Plan of Mutual Funds? I have not found name of UTI mutual fund. UTI is serviced by Karvy – have updated in post now. Thanks for pointing this out.